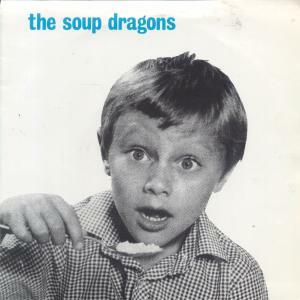 Leading on from my post about BMX Bandits, and the Peel session recently posted on The Perfumed Garden, I'm giving you a Soup Dragons track from their withdrawn first single. The band was fronted by Sean Dickson (who was in the original line-up of the Bandits) and they were very good for a few years, before they turned crap. The session posted by Kris contains (a slightly incomplete) "Whole Wide World", which DID become the first single. It also has a great track called "Just Mind Your Step Girl" - brilliant title as well! "Whole Wide World" became the fourth release on Martin Whitehead's Subway Organisation but The Sun Is In Sky EP would have been SUBWAY2. Had it not been for the fact that the lettering on the cover (adorned by the same photo as the Whole Wide World cover shown above) was flawed, and that Sean wasn't satisfied with the songs. They're still in boxes in Martin's home! Here's the second of the four songs on the ep, with the eloquent line "I would give you flowers, you would give me hate".